HATHORNE, Mass. — In a darkened classroom in Essex Technical High School, Anna Maria Miller takes careful notes while watching a subtitled video sampling from Rwanda’s infamous “hate radio,” which helped fuel the genocide of the minority Tutsi population in 1994. Today’s assignment for these high school seniors: Compare and contrast the propaganda methods used by that country’s Hutu majority and by Germany’s Nazi regime in the ’30s and ’40s. The next school day and a just a few floors below, Miller is in the school’s biotechnology lab where students are learning the skills they would need for a job testing specimens for the presence of amalyse, the protein enzyme that breaks down starch into sugar. Using tweezers, she carefully eases a small transparent membrane off a glass tray without allowing it to stick or tear. “Anna has the steadiest hands,” says one of her classmates, observing the deft transfer. Essex Tech is what used to be known as a vocational school. 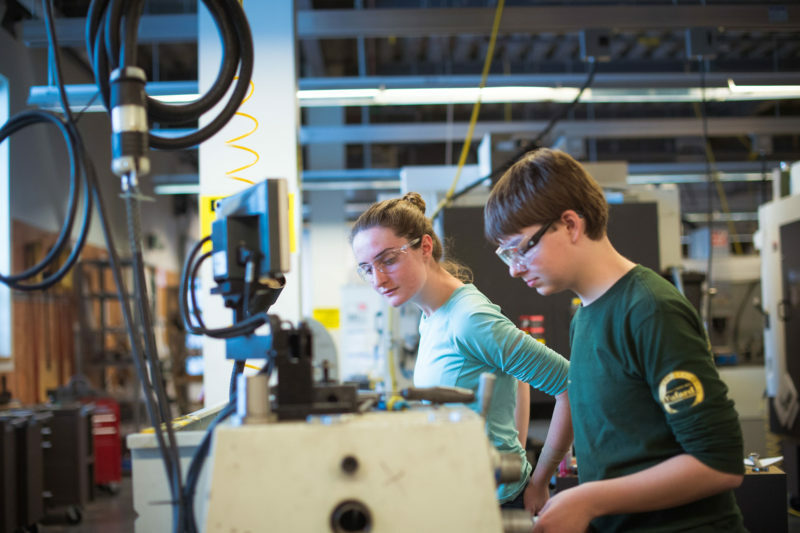 Massachusetts is turning that traditional model on its head by having many schools combine rigorous academics with hands-on career training, now called “career and technical education.” The state is making a sizable investment in these schools, with an eye toward fueling its economic engines by teaching students how to play a role in high-need, growing fields like advanced manufacturing and health services. 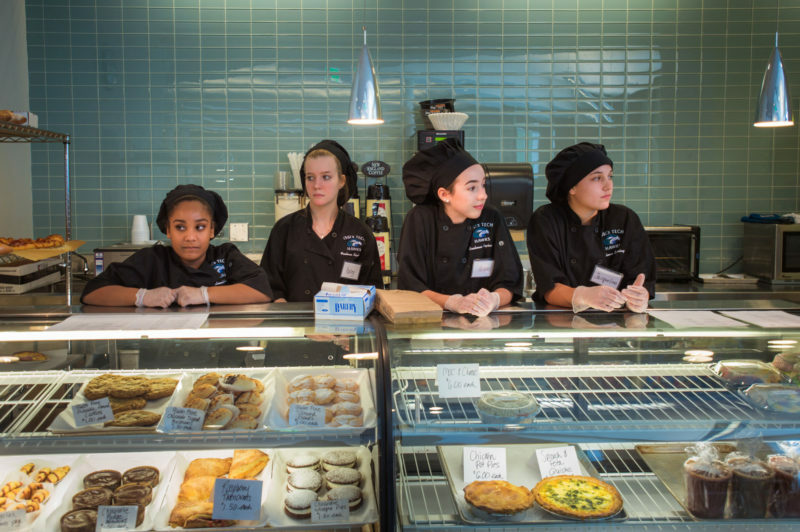 Ideally, their high school graduates will be able to handle college-level work or step right into a good-paying job. But creating schools that combine academics and training is a tough balancing act for the state and for local districts. Career and technical schools are expensive to operate, and finding teachers with the necessary skills and credentials can pose a challenge. And then there’s the schedule: Essex Tech’s students complete the same academic requirements as their peers at traditional high schools but are expected to do so in 90 instructional days rather than 180. The remaining 90 days are spent in vocational “shops,” such as Culinary Arts, Cosmetology, agriculture, health professions and construction trades, as well as plant and animal sciences. Students can earn a standard high school diploma as well as professional certifications in their career fields. And so far, at this regional campus serving close to 1,400 students drawn from a wide swath of the Bay State’s North Shore, the redistribution of instructional priorities is yielding big dividends. Like many of their peers at similar high-quality vocational campuses elsewhere in the state — and across the country — Essex Tech’s students are significantly less likely to drop out and more likely to graduate, and roughly eight out of 10 plan to pursue a postsecondary education, according to the school’s annual accountability reports. “Purposeful” might best describe the school’s climate. While not immune to the social cliques and occasional unkind behavior endemic to adolescence, Essex Tech students and faculty said that those instances are infrequent and relatively minor. “I think if you tried to be a real bully here no one would even take you seriously,” said Dylan Jenkins, a junior in the Natural Resource Management program. On a Monday in early January, Essex Tech is playing catch-up after winter storms forced a four-day weekend. Equine Science students lead the school’s horses to a large fenced pasture, where they roll in the fresh snow like colts. 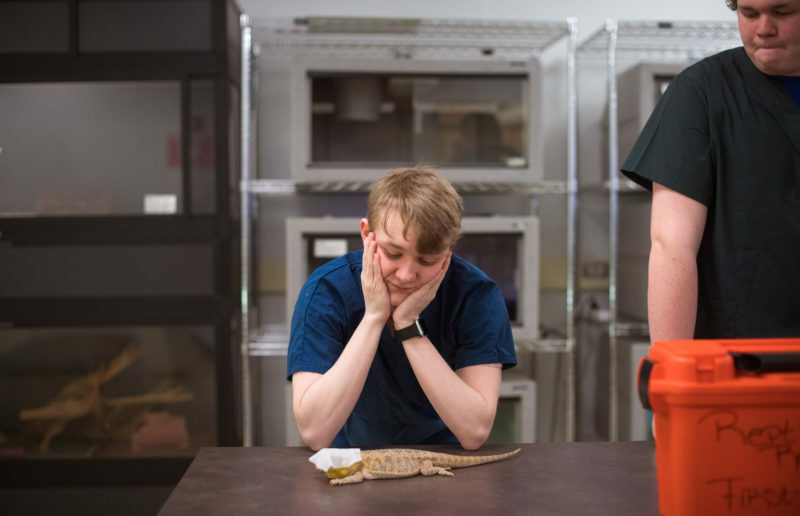 Inside a nearby building, students in the Veterinary Science program are checking over guinea pigs, rabbits, reptiles and rats. Opened in 2014 when two existing vocational programs consolidated, Essex Tech is preparing to graduate its first senior class to have spent the entirety of their high school careers at the new campus. Students come from 17 “sending” districts and other surrounding communities that don’t have comparable vocational programs already available. The school’s students are predominantly white (consistent with the North Shore communities it serves), with females accounting for about 60 percent of the total enrollment. The largest population of students of color are Hispanics, at about 12 percent. Just over 18 percent of the school’s students are economically disadvantaged. A similar proportion receive special education services, on par with the statewide average for high schools. Overall, a third of the school’s students are identified as “high needs,” a designation that includes special education students and English language learners, students who are in foster care or from households receiving state assistance with food or housing and those from economically disadvantaged families. The admissions team says it looks for a diverse student body on all fronts, including socioeconomic, gender, race and academic ability. Essex Tech’s state-approved admissions policy considers prior academic performance, teacher recommendations and an in-person interview among other factors. Last year Essex Tech fielded close to 1,300 applications for fewer than 400 seats, according to the school’s admissions office. Essex Tech’s MCAS scores have climbed steadily since the campus opened, and the vast majority of its students met or exceeded the state’s standards for basic proficiency in reading, math and science in 2017. Last year, just over half of Essex Tech’s senior class reported they were headed to four-year colleges. Another 18 percent planned to attend two-year colleges, while 30 percent said they would enter the workforce, according to the school. To be sure, tracking long-term outcomes for high schoolers is a challenge for educators and researchers looking to weigh the effectiveness of instructional models. Essex Tech officials say they’re discussing options for keeping in touch with graduates to better inform the school’s methods moving forward. The school does know that many students have been hired by the same employers who supervised them during their school internships, Riccio said, and have been able to bypass entry-level positions. Gabriella Okparaoko was accepted at two high-ranking college-prep charter schools. But she opted instead for Essex Tech, where she’s now a junior in the Automotive Technology program. She sets her first alarm of the day for 5:25 a.m. to make sure she can catch the 6:20 a.m. bus for an hour-long ride to school. Okparaoko, who wants to become a mechanical engineer, is happy about her decision, despite the long hours. Because she plans to apply to competitive colleges (Georgia Tech is her first choice), Okparaoko is mindful of her academic resume. She attends North Shore Community College in the summers, and has already racked up credits in philosophy, English and television and radio production. 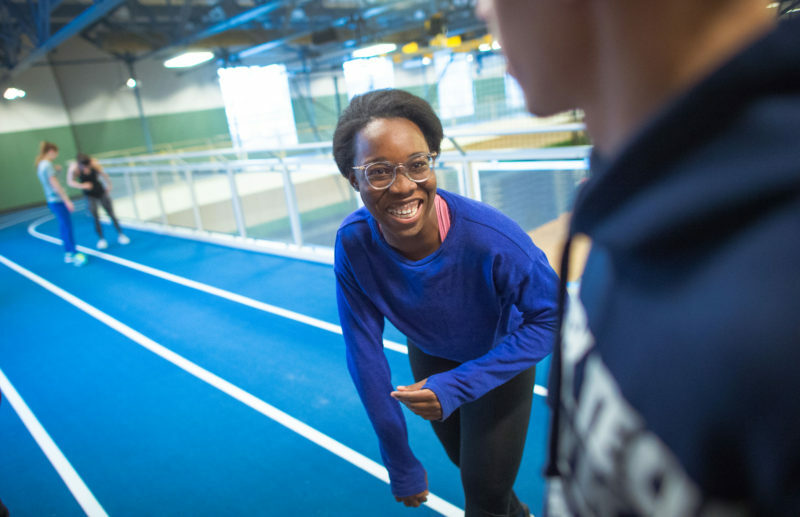 There are clubs and activities she would join if there was time, but for now she’s limiting herself to the school’s track and field team: “I really, really, love the shotput,” she said. One way the school has tried to encourage students’ to keep their options open is by introducing college seminar-style classes like the Genocide Studies course, currently an honors-level elective. English teacher Justin Bilton and history teacher Jason Stark created and team-teach the class. Bilton had studied the topic as part of his graduate work at Salem State University, and later attended an educators’ workshop in Washington at the U.S. Holocaust Memorial Museum. Stark’s grandmother escaped Germany in 1939, although many close family members, including her parents and brother, perished in Nazi concentration camps. While discussing their respective backgrounds, the two teachers wondered if there was a way to give students a deeper understanding of genocide than what was covered by the state’s instructional “frameworks” — Massachusetts’ version of the Common Core standards. Historical documents and literary fiction make up the curriculum. 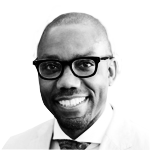 First-person accounts, like a recording of Stark’s grandmother describing her wartime experiences and a visit to the school by a Rwandan genocide survivor, help to keep the material on a scale that students can understand, Bilton said. 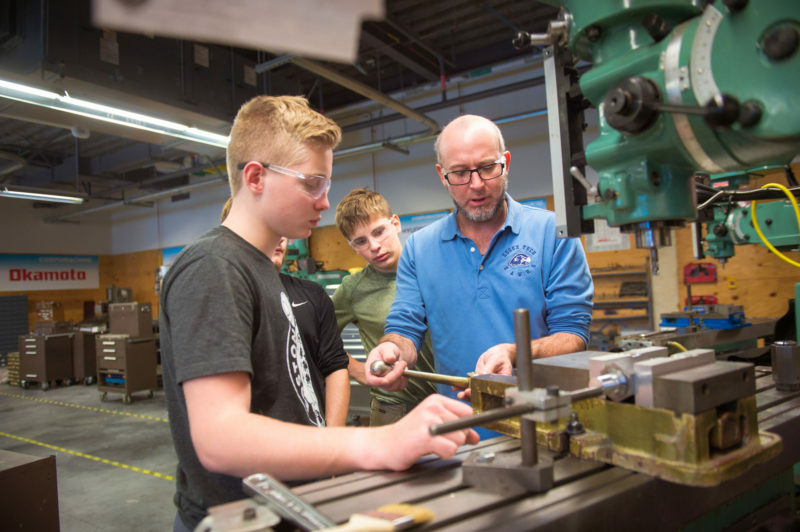 A frequent refrain among Essex Tech staff is that some kids seem to have their “shop brains” and their “academic brains,” and the two don’t overlap often enough, something the school is trying to change. Yet some students say they’ve already found surprising connections between the genocide class and their vocational training. Emily Brown, a senior studying Sustainable Horticulture, said learning that farms and farmers were often components of genocides — either as valuable prizes to be seized or as resources for forced labor — was a powerful moment for her. It’s a challenging curriculum for high schoolers, O’Toole said. But the high bar hasn’t discouraged student interest: The class has become so popular that next year two sections will be offered instead of just one, and it will be upgraded to a credit-bearing course so that more students will be able to fit it into their schedules if they choose to, he added. To be sure, high-quality career and technical education isn’t for everyone. But experts like Nancy Hoffman, a senior advisor to the nonprofit Jobs for the Future, say the hands-on learning inherent in career programs can often motivate young people in a way textbooks and tests can’t. Students need to know both the “why” of what they’re doing as well as the “how,” she added. Even as his students discussed possible workarounds, Xerras reminded them that some of the parameters couldn’t be changed. 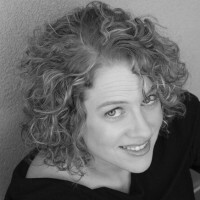 “We still have to adhere to … what? What do we have to adhere to?” he asked. “The code,” several of his students answered almost in unison, referring to the state’s regulations for licensed electricians.